Got this cute piece courtesy of the good folks at the GenealogyBank blog. The newspaper editor of the Norfolk Advertiser had a little fun with this marriage announcement. 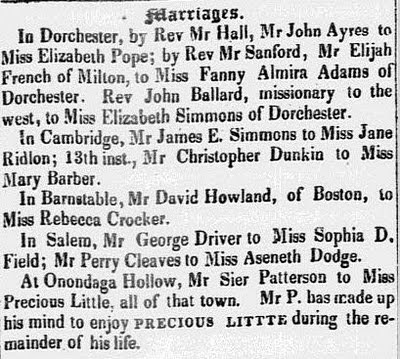 The last marriage reads: At Onondaga Hollow (now Syracuse, New York), Mr. Sier Patterson to Miss Precious Little, all of that town. Mr. P. has made up his mind to enjoy Precious Little during the remainder of his life. (22 August 1835, page 3). For newspaper research I highly recommend GenealogyBank. I have made significant genealogical discoveries in the last few years regarding my family via their service. You can read about some of them on my personal blog at http://larry-family-history.blogspot.com/. There is a link to GenealogyBank in the Genealogy Research Site section of this blog (right side of page).